Travelling photographers are caught between a rock and a hard place. Camera equipment tends to get heavier and bulkier, while airlines baggage limits get smaller and more restrictive. For people with lots of photo equipment, this is a total nightmare. One the one hand, you should never check-in your camera bodies or lenses (not to mention laptop computer and hard disks). On the other, you can't possibly carry everything you need and stay within baggage restrictions. As such, much of my life is spent figuring out new and improved ways to get the gear I need from one place to another. For this trip, I tried a new configuration for my carry-on baggage, comprising a Think Tank Airport Antidote backpack and a Lowepro Inverse 100 AW waist pack. I use a backpack because, in my personal experience, airline employees are less likely to check backpacks than they are bags on wheels. I've walked straight through with 25kg on my back, while a friend with 14kg in a roller bag got nailed and was forced to pay excess baggage at a bargain rate of US$22/ kg. Plus the airline forced him to check his bag and put all his cameras and lenses at the mercy of baggage handlers (and we all know that baggage handlers treat every bag with lots of TLC). I choose black backpacks, because, as every fashion baron in-the-know can tell you, black makes things look thin and light (and it also doesn't get dirty as easily...an absolute necessity for me!). 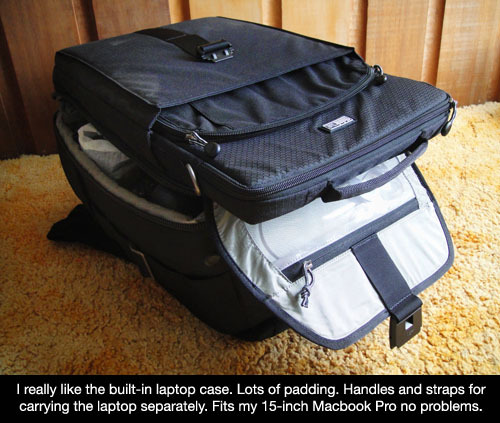 It helps a lot if you can lift your backpack with ease and make it look light too (a definite incentive to work out). 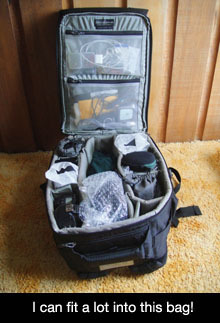 I decided to try the Think Tank because my previous Lowepro Mini Trekker AW was at the end of its life. 15 years of abuse was all it could take. There are only so many times you can stitch, glue and band-aid a camera backpack back together before it just gives out. My Lowepro was fantastic, so if you're thinking about getting a Lowepro...I have no hesitation recommending their bags. After using my new Think Tank backpack on a couple of flights, I like it for the most part. For its small dimensions, the bag can take a lot of stuff. I packed three DSLR bodies, a big zoom lens, a wide zoom, several prime lenses and a bunch of junk (including a Seacam fisheye dome and a Fathoms 90º port for a Stingray housing...both of which I picked up at Scubacam) into the bag without too much difficulty. The zippers are sturdy, and the material is excellent quality. My favourite feature of the bag is the built-in laptop sleeve, which comes with a padded laptop case that fits my 15-inch Macbook Pro perfectly. Having this sleeve makes it easy to take the laptop out for those enjoyable inspections at the airport, and the padded case is sturdy enough that you can use it to carry around your computer separately if you so choose. It comes with a strap for that purpose. One minor gripe I had was that there are no large pockets on the outside of the backpack. This means I don't have any place to stick my passport case. There is a small zippered area at the top of the backpack that's more than enough for just a passport and/ or tickets, but I have lots of junk in my passport case (surprised?) that I need to keep in one place. I'll learn to make do, but I sure wish the backpack had a large zippered compartment on the outside. Next, based upon the theory that having a waist pack would mean I could split my carry-on junk into two bags and hence reduce the spine-contorting load in my backpack, I bought a Lowepro Inverse 100 AW bag. Of course, I should've known better. All that happened was that I filled both bags, meaning a net increase in weight. Live and (probably not) learn. Anyway, the waist pack works well. It takes a bit of getting used to, since it's a bit bulky and I'm not accustomed to having something like this around my waist. But with this bag, I was able to carry one more DSLR, two more lenses, a small video camera and two handheld GPS units, plus a bunch of little things that didn't fit anywhere else. The bag has a tendency to flop forward a bit (perhaps because I stuffed it silly), but it's only a minor irritation. With the Think Tank, the Lowepro waist pack and a camera vest, I was able to hand-carry 25+kg of gear for this trip (all my camera bodies and lenses, plus accessories). This set up is compact, and everything fits comfortably into the overhead compartment and space under the seat in front of me on the plane. On the small domestic plane in Tonga, I had to remove the laptop case, but the laptop fit right into the seat pocket, so it was no big deal. The major hassle-factor comes with going through X-ray. I had to take out my laptop first, then put my backpack, my waist pack, and my camera vest through, and finally collect and re-assemble everything on the other side...all part of the convenience of modern air travel. Not everyone has as much gear to transport, but if you're looking for alternatives for lugging camera gear on long trips, these bags, or something like them, might come in handy. With this configuration, I make sure that I get an aisle seat (for quick access to the overhead bin) and also that I don't get a seat in the first row or in the emergency exit row, since there's no seat-in-front-of-you storage space. Remember though, there's always a possibility that you run into a totally unreasonable, draconion person on a power trip who decides he/ she wants to ruin your life and demands that you dump all your gear. I've only encountered the problem once...a nice lady (NOT!) on Ansett Airlines, which has since gone belly up, due in large part, no doubt, to her attitude problem.